There were many ways that people resisted the Nazi fascist state during WWII including sabotage, infiltration, escape, and armed militant struggle. Here are three stories of different women who used their strengths and the resources they had available to resist the violence of the Nazis. 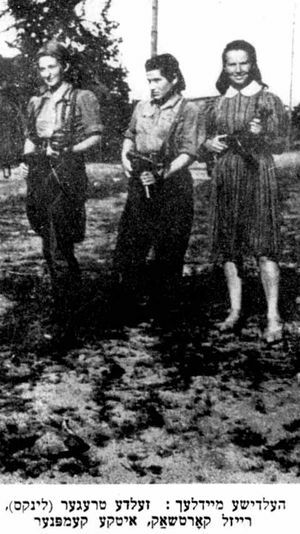 Born in 1920 in Western Poland, Vitka Kempner was the first woman to join the Revisionist (Zionist) militant group in Betar. For many years she engaged in anti-Nazi struggle including blowing up Nazi trains, guided groups of Jewish fighters to the forest to hide, and later in 1945 formed the Organization of Eastern European Survivors to help evacuate Jews from Eastern Europe. Niuta Teitelboim was a Polish communist engaged in many Jewish resistance and communist groups. Because of her blonde hair and blue eyes, she was often tasked with missions in and out of the ghetto, fooling SS soldiers and foiling some of their plans. Teitelboim was also responsible for assassinating an important Gestapo officer in Warsaw. Rosa Robota was a member of the Jewish underground in the Auschwitz-Birkenau death camp. She was tasked with smuggling explosives for use by Sonderkommando (the forced-labor unit of the Jewish concentration camp prisoners) and was involved in the 1944 revolt in that camp. She was eventually assassinated for her organizing.